Konrad Cramer grew up in Wurtzburg, Germany, and attended the Karlsruhe Academy. He was a member of Der Blaue Reiter—among one of the earliest modernist movements in Europe. Der Blaue Reiter, based in Munich, was founded by Wassily Kandinsky, Alexej von Jawlensky, and Franz Marc, among others. In 1911, Cramer married Florence Ballin, an American artist studying in Munich. The couple moved to the United States, and eventually settled in Woodstock, New York, where they were soon active in a circle of artists that included Andrew Dasburg, Yasuo Kuniyoshi, and Elie Nadelman. Cramer’s first exhibition in the United States took place in 1913 at the Arts Club, where he exhibited several of his “Improvisation” paintings. Cramer also found success as a photographer for the Works Progress Administration in the 1930s. The artist was among one of the first to practice pure abstraction in painting in the United States. Later he returned to more representational imagery influenced by both abstraction and folk art. Cramer taught at the Woodstock School of Painting and the Dalton School in New York City. 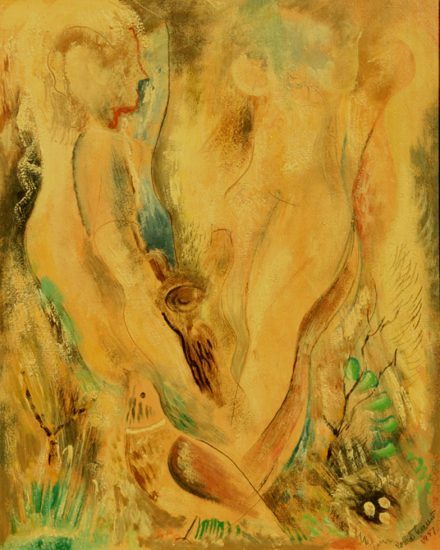 He remained active as a teacher and artist in Woodstock up until his death in 1963.